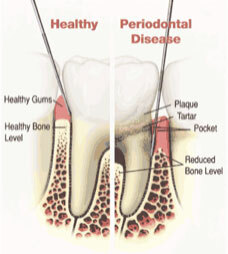 Periodontitis is an infection of the bone and gums which surround the teeth. It is caused by the bacteria which normally reside in your mouth. mouth. When the bacteria become more numerous than normal, or at a level which your body can not tolerate, an inflammatory reaction takes place and your body begins to destroy the bone which supports the teeth. When the bacteria in your mouth causes bone loss, the gum tissue does not always recede with the bone loss. Pockets are created which harbor more bacteria and are unreachable with a normal toothbrush and floss. The deep pockets perpetuate the cycle of bone loss. The teeth subsequently become loosened, and if not treated in a timely manner, the teeth can even be lost. During this process, there can be a foul order from the mouth, as well as infection (pus) coming from the gums. But this process is usually painless and can sometimes go unnoticed for quite some time until significant symptoms, such as bad breath, loose teeth, indicate a problem. The best way to prevent cavities and periodontitis is by good tooth brushing and flossing on a daily basis to remove the damaging bacteria. These bacteria cannot be eliminated from the mouth, but they can be kept under control and kept from causing more bone loss. Other factors which can negatively affect your periodontal health include, tobacco smoking, diabetes, stress and hormonal changes, clenching or grinding of your teeth, certain medications, poor nutrition, and genetics. Because of these other factors, sometimes even with the most diligent oral home dental care, people still develop some form of periodontitis. If this is the case, professional intervention is necessary to prevent its continued progress. Research has shown that patients with periodontitis are approximately 3 times more likely to suffer from cardiovascular disease. Reducing periodontal infection in the mouth can reduce the risk and severity of cardiovascular disease like heart attack and stroke, can improve glycemic control in diabetics (who are 3 times more likely to have periodontitis), and reduce the risk of a pregnant mother to deliver a pre-term low birth weight infant. Inversely, it is also known that uncontrolled diabetes makes it more difficult to control and manage periodontal infection. The same may be true for cardiovascular disease as well. Of special mention is smoking and its association to periodontitis. Besides the obvious risk of oral and lung cancer, and lesser known risk for heart attack and stroke, smoking is the single strongest factor increasing the risk of bone loss in someone susceptible to periodontitis. It has been established to be responsible for making bone loss 6 times worse for a periodontitis patient compared to someone who is not smoking. It has even been estimated that nearly half of all the periodontitis cases in the United States could be eliminated if people would stop smoking. Smoking will also reduce your healing response to periodontal treatment by 50 % and increase your risk for implant loss by 5 times. Even if you can't quit, just by reducing your smoking habit will improve your response to therapy, although complete cessation is ideal. Medication can be prescribed to help assist you in quitting smoking, but are dependent on your desire to quit...in other words, the medication can't make you quit if you don't want to quit smoking. Several links are provided below to help guide you if you’re ready to quit smoking. There are two main forms of treatment for periodontitis: surgical and non-surgical. The beginning treatment for periodontitis in our office usually begins with non-surgical treatment called “scaling and root planning”, followed by a re-evaluation about a month after the scaling appointment, to establish any other form of treatment that may be needed. As mentioned before, the bacteria that are naturally in the mouth can overpopulate in the form of dental soft plaque and hard calculus if the teeth are not properly cleaned on a daily basis. The bacterial toxins that result can cause destruction and inflammation initially of the soft tissue and gums around the teeth as show in the picture below. As the disease progresses, the bone is also affected. If the disease is left unchecked, the teeth can potentially be lost. As the bacteria in the form of plaque are the cause of periodontal disease, their gross removal and reduction is the first step in the termination of this process. This removal takes place in the form of scaling and root planing. Scaling and root planing involves the use of a special ultrasonic device with water irrigation to cleanse the pockets of plaque and debris and remove hard calculus deposits. Local anesthetic is also used to numb the area to be treated in order to reach the base of the pocket without causing you discomfort during the treatment. Usually the treatment of the entire mouth takes place. This treatment will reduce the inflammation and reduce pocket depths by allowing your gum tissue to reattach to the tooth root surface. It is not unusual to experience some soreness in the treated area but usually a non-steroidal anti-inflammatory drug, like Advil (ibuprofen) is recommended to control this discomfort. Temperature sensitivity may also be a side-effect of the treatment and should resolve in a few weeks. If this does not, other treatments are available to reduce this sensitivity. Finally, recession after treatment is normal since the swelling of the infected gum tissue is reduced after therapy. Of vital importance in the treatment of periodontitis is the patient's responsibility in maintaining proper oral hygiene in between dental visits. 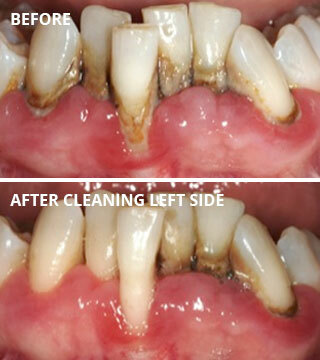 Oral hygiene instruction and direction in the use of various cleaning instruments are discussed in detail and individualized to your specific needs. Without proper oral hygiene as performed by the patient, the success of therapy is greatly reduced. Sometimes, scaling and root planing is all that is needed to control the disease process, and a regular schedule of maintenance cleanings is necessary to monitor any changes in the disease activity through changes in the pocket depth. If the pocket depth continues to progress or are not resolved with initial scaling and root planning, surgery may be necessary to correct the loss of bone and resultant pocketing. When initial conservative therapy in the form of scaling and root planing does not resolve the deep pockets, surgical intervention is necessary to eliminate these pockets. One way to do this is to expose the underlying bone and to level out the area of bone loss. Once the gum tissue heals back to the bone, the pockets are reduced to a level which can be maintained through normal brushing and flossing, usually 3mm or less. As a result, more of the root surface of the teeth are exposed. Surgery in general requires the use of local anesthetic to numb the area to be treated. In addition, if you are particularly fearful or anxious, oral medication, and/or IV sedation can be used to help you relax during these appointments. Stitches will usually be placed and removed a week later. You will also be prescribed a special mouth rinse to help keep your mouth clean and prevent infection for the first week after surgery, as you will not be permitted to brush or floss the surgical areas. Most patients are placed on a regimen of antibiotics and steroid medication to help reduce the amount of swelling and inflammation and to prevent infection. Advil (ibuprofen) is recommended for pain control. General instructions, along with specific instructions regarding the types of food you may consume after surgery, will be reviewed with you at the time of your surgery. A special instruction sheet will be given to you to take home to ensure proper protocol is followed to maintain your comfort at home.